This is fantastic! Simple to make and wonderfully tasty. I found the recipe a few months ago and have already made it 5-6 times! It's almost like candied salmon - but not that sweet. 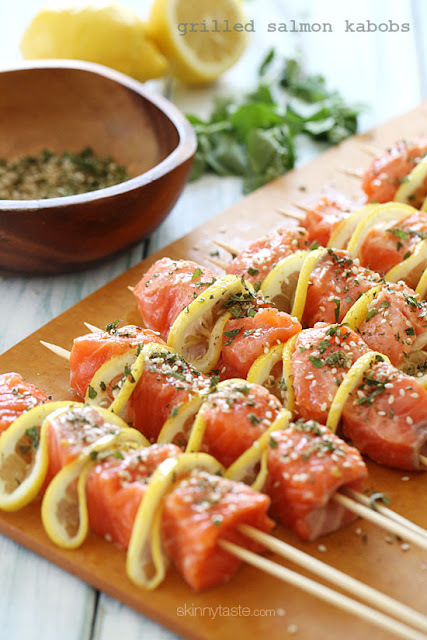 I did have difficulty getting 12 skewers out of a pound of salmon but it really doesn't matter how many you have as long as they're all about the same size so they cook evenly. On the one occasion we had a few skewers left over, I stripped off the salmon, mixed it up with a little mayo and had a great salmon spread for crackers as well! Heat the grill one medium heat and spray the grates with oil. Mix oregano, sesame seeds, cumin, and red pepper flakes in a small bowl to combine; set spice mixture aside.